Package Theft is a problem year round. During the Holiday Season, it only gets worse. “Porch Pirates”, those people who follow parcel delivery and US Postal Employees delivering those packages, target those deliveries with hit and run tactics that take just moments to steal those parcels. Tri Cities Crime Stoppers in conjunction with local law enforcement agencies want to make sure your deliveries are safe, secure and don’t fall into the hands of those “Porch Pirates”. 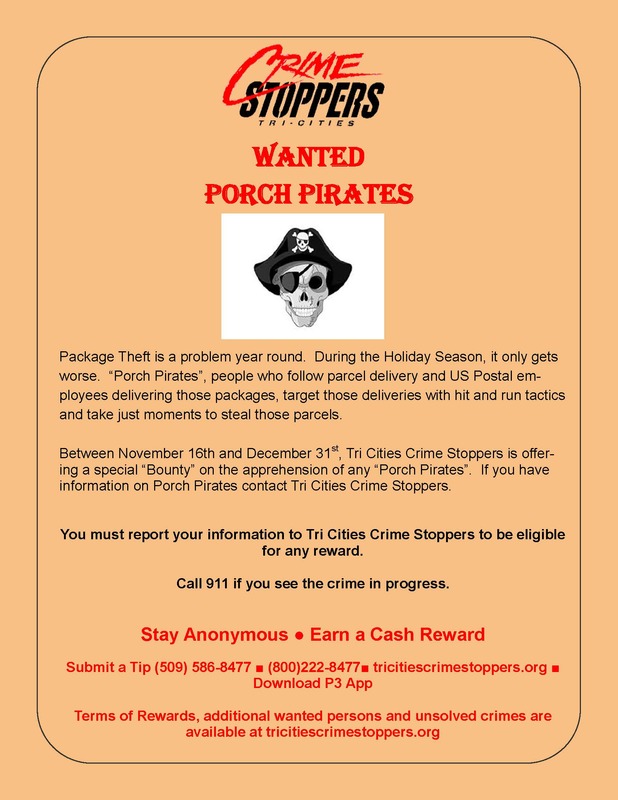 Between November 16th and December 31st, Tri Cities Crime Stoppers is offering a special “Bounty” on the apprehension of any “Porch Pirate”. If you are a victim of a “Porch Pirate”, contact your local law enforcement agency and file a report. If you have video or still images of the theft, provide that to law enforcement and request they forward that to Tri Cities Crime Stoppers. Tri Cities Crime Stoppers will post that information on its social media pages and include a minimum reward of $100.00 for information which results in the arrest of those persons involved. * Crime Stoppers pays for information that is provided to Tri Cities Crime Stoppers and not directly to law enforcement agencies. If you witness any crime taking place, call 911. Enlist a Neighbor- Have deliveries made to a trusted neighbor who is home during the day. Delivery at Work- Ship directly to your work. Delivery Alerts- Sign up for notification when a delivery is made. Install a Box Lock- A system that safely secures packages in a container with a special padlock accessible to delivery persons. Cameras- Some provide the ability to alert you to a delivery as well as recording the possible theft. Offsite Lock Boxes- Some companies provide secure delivery to a locker in the neighborhood where you can pick up your package. Neighborhood Watch- Be the eyes and ears of law enforcement and look out and report suspicious persons and vehicles. Tri Cities Crime Stoppers is a 501(c) 3 nonprofit organization that works with local law enforcement and the community to provide a way to report information anonymously. No tax payer’s money is used to pay rewards for information and all tipsters can remain anonymous when reporting information to Crime Stoppers.